Purpose: This study aimed to evaluate the loading capacity (LC) and entrapment efficiency (EE) percentages of multi-Material of Institute Lavoisier (MIL)-100(Fe) (M-MIL-100(Fe)) for ACF. Materials and methods: Hydrothermal synthesis procedure was used to prepare multi-MIL-100(Fe) samples (Zn I-MIL-100(Fe), Zn II-MIL-100(Fe), Ca I-MIL-100(Fe), Ca II-MIL-100(Fe), Mg I-MIL-100(Fe), Mg II-MIL-100(Fe), Mn I-MIL-100(Fe), and Mn II-MIL-100(Fe)). The characterization of M-MIL-100(Fe) samples was evaluated by X-ray powder diffraction (XRD), Fourier transform infrared spectra, scanning electron microscope (SEM), TGA, and N2 adsorption isotherms. The LC of M-MIL-100(Fe) and EE of ACF were determined. Nuclear magnetic resonance (NMR) and zeta-potential analyses were employed to confirm qualitatively the drug loading within M-MIL-100(Fe). Results: The ACF LC of MIL-100(Fe) was 27%, whereas the LC of M-MIL-100(Fe) was significantly increased and ranged from 37% in Ca I-MIL-100(Fe) to about 57% and 59% in Mn II-MIL-100(Fe) and Zn II-MIL-100(Fe), respectively. The ACF@M-MOFs release profiles showed slow release rates in phosphate buffer solutions at pH 6.8 and 7.4 as compared to the ACF@MIL-100(Fe). Conclusion: Therefore, M-MOFs showed a significant potential as a carrier for drug delivery systems. 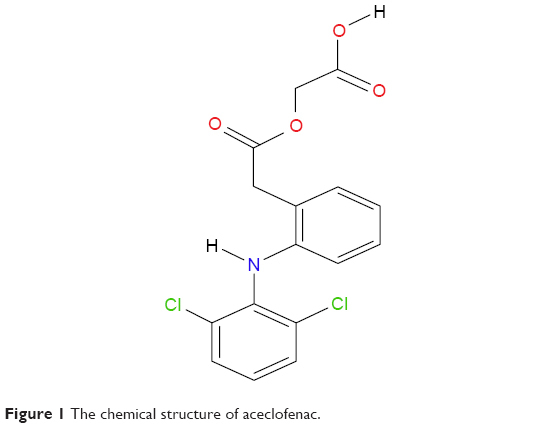 Figure 1 The chemical structure of aceclofenac. Controlled drug release systems with appropriate carriers, which include liposomes, dendrimers, micro sponges, microparticles, and micelles, have been employed to increase the therapeutic effectiveness and minimize the side effects of low water-soluble drugs. Several undesired adverse effects, which are accompanied with ACF oral administration, such as gastrointestinal tract (GIT) irritation, ulceration, and bleeding,22 are leading the researchers to develop a new drug delivery system to reduce such adverse effects. In this study, eight samples of M-MIL-100(Fe), Zn I-MIL-100(Fe), Zn II-MIL-100(Fe), Ca I-MIL-100(Fe), Ca II-MIL-100(Fe), Mg I-MIL-100(Fe), Mg II-MIL-100(Fe), Mn I-MIL-100(Fe), and Mn II-MIL-100(Fe) were synthesized, characterized, and evaluated for their application as a drug delivery system to evaluate the loading capacity (LC) of M-MIL-100(Fe) for ACF and define M-MIL-100(Fe) as a potential drug delivery system for ACF. ACF was purchased from Thermo Fisher Scientific, Waltham, MA, USA. All chemicals such as iron chloride hexahydrate (FeCl3.6H2O), benzene-1,3,5-tricarboxylic acid (H2BTC, C9H6O6), zinc nitrate hexahydrate (Zn (NO3)2.6H2O), calcium nitrate tetra hydrate (Ca (NO3)2.4H2O), magnesium chloride hexahydrate (MgCl2.6H2O), and manganese chloride hexahydrate (MnCl2.6H2O) were supplied by Sigma-Aldrich Co. (St Louis, MO, USA) and used without further purification. Ethanol (C2H6O >95%) was purchased from Sigma Aldrich and used without further purification. Acetonitrile (C2H3N 99.9%) and phosphoric acid (H3PO4 85%) were supplied from Fisher Scientific, Merelbeke, Belgium. Abbreviation: M-MOF, multimetal organic framework. X-ray powder diffraction (XRPD) was performed using a D8 Advance (Bruker AXS, Karlsruhe, Germany), with a copper Kα radiation source (40 kV and 40 mA) with a Lynx Eye detector. The 2-theta scan range was 5°–20°. NMR spectroscopy (Bruker Advance III 400 MHz spectrometer (Germany) with BBFO Plus multi-nuclei probe and low and high temperature capability). Nuclear magnetic resonance (NMR) spectra were referenced to their solvents: deuterium oxide (D2O, 1H, δ 4.79 ppm). Textural properties of M-MIL-100(Fe) were characterized by N2 adsorption–desorption isotherms, which were obtained at 77 K using a micromeritics, TriStar-3020 instrument, to determine the specific surface area, pore size, and volume. In brief, a 100 mg of the sample was first dried at 373 K in an oven and then it was degassed by Vac Prep™ 061 at 433 K overnight. Finally, the degassed sample was used in the TriStar instrument for analysis after getting the net weight of the sample. Fourier transform infrared spectra (FTIR) were obtained using a PerkinElmer FTIR spectrometer in the range of 650–4,000 cm−1. The morphological description was achieved by using a Zeiss Neon 40EsB FESEM. Zeta potential was determined by a Zeta sizer Nano-ZS (Malvern Instruments, Malvern, UK) at 298 K. More specifically, the materials were mixed with distilled water and stirred for 1 hour to be suspension system at constant temperature (298 K) and then was examined. The ACF calibration assay was analyzed by HPLC (Shimadzu 20 AC), and the mobile phase was 50 mmol phosphate buffer solution at pH 6.8 with acetonitrile 30% at a range of ACF concentrations (10, 20, 30, 40, 50, and 60 μg/mL) in ethanol (95%). The L-max was 274 and the flow rate was 1.5 mL/min. Figure 2 XRPD of MIL-100(Fe) and M-MIL-100(Fe) samples (where M is either Ca (A), Mg (B), Mn (C), or Zn (D)). Abbreviation: XRPD, X-ray powder diffraction. Thermal stability of all samples was similar to that of main structure of MIL-100(Fe). The structure collapsed when the temperature was raised to about 580 K as shown in Figure S1. In addition, the morphological descriptions are shown in Figure S2. It seems that particle size was similar in all samples except in Zn-MIL-100(Fe) samples where the particles were enlarged. This is due to adding Zn2+ to the MIL100(Fe). It seems that zinc salt might lead to slowing down of the nanocrystal nucleation process and growing up of the particles size to be larger specially in the presence of water as a solvent in the synthesis procedure. This is related to the high deliquescent property of zinc nitrate hexahydrate.24,25 Although the particle size commonly used for drug delivery was less than 100 nm, the sizes of particles ranged from 100 to 250 nm are also preferred in drug delivery system. Hence, it can be confirmed that the drug can be delivered to the specific organ or tissue in the desired final dose.26 Figure S3 shows that functional groups on the surfaces of the pores were maintained in M-MIL-100(Fe) samples as in MIL-100(Fe). 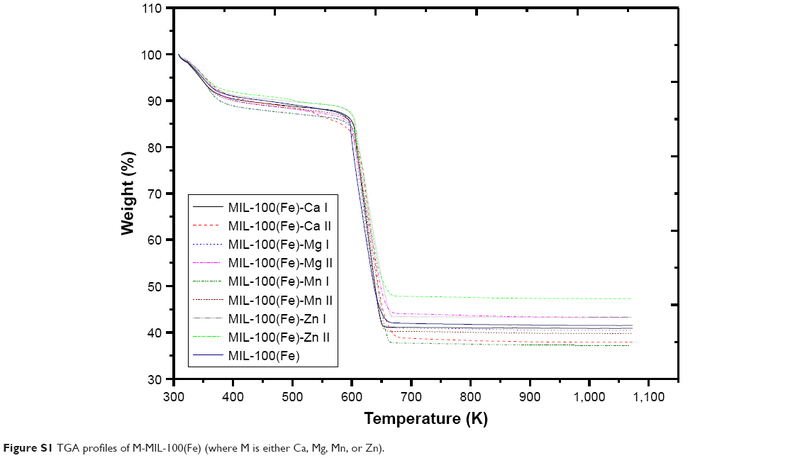 Figure 3 N2 adsorption–desorption isotherms for MIL-100(Fe) (A) and M-MIL-100(Fe) (M is Ca (B), Mn (C), Mg (D), or Zn (E)) samples. Abbreviations: ACF, aceclofenac; EE, entrapment efficiency; LC, loading capacity. 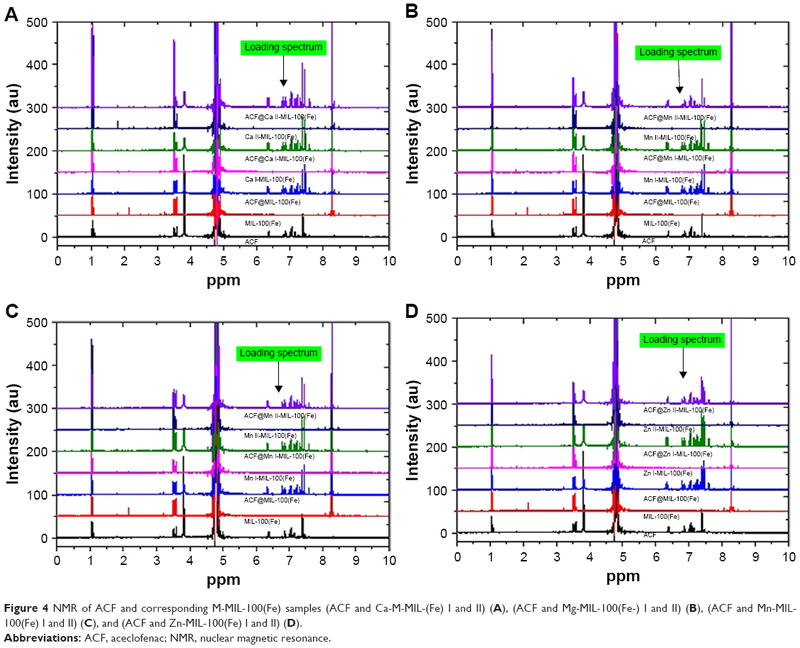 Figure 4 NMR of ACF and corresponding M-MIL-100(Fe) samples (ACF and Ca-M-MIL-(Fe) I and II) (A), (ACF and Mg-MIL-100(Fe-) I and II) (B), (ACF and Mn-MIL-100(Fe) I and II) (C), and (ACF and Zn-MIL-100(Fe) I and II) (D). Abbreviations: ACF, aceclofenac; NMR, nuclear magnetic resonance. Abbreviations: ACF, aceclofenac; MOF, metal organic framework. The release profiles of ACF were achieved in the simulated GIT and plasma medium of phosphate buffer solutions at either pH 6.8 or 7.4. The ACF release profiles are shown in Figure 5A–D for all ACF@M-MIL-100(Fe) samples. 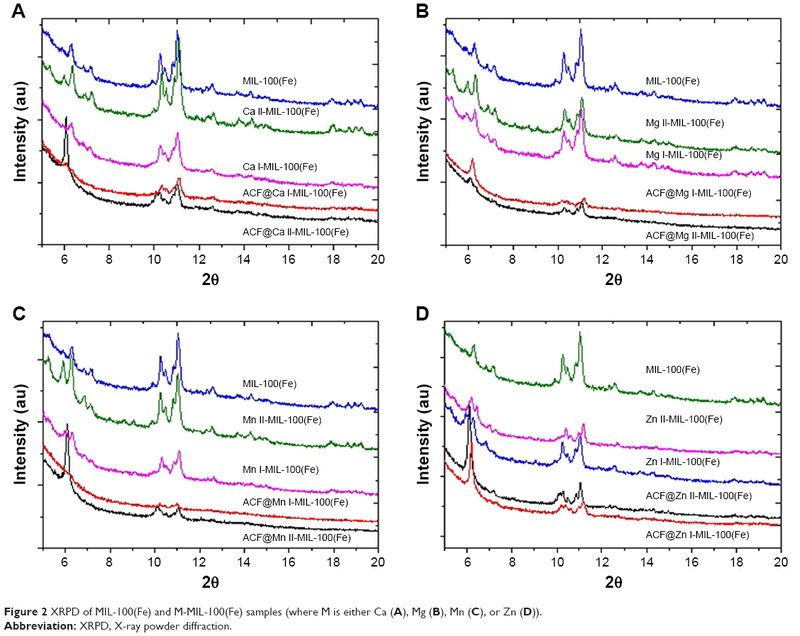 Figure 5 The release profiles of (A–D) represent all ACF@M-MIL-100(Fe) (Zn, Mn, Mg, and Ca, respectively) samples in 50 mmol phosphate buffer (pH 6.8 and 7.4) at 37°C±1°C. The second metal was successfully incorporated with base metal. A low concentration of the second metal was investigated in the final product although a high concentration was used in the synthesis procedure. It seems smaller amounts of the second metal (Ca2+, Mn2+, Mg2+, and Zn2+) were incorporated in metal center of MIL-100(Fe), and the remaining amount worked as a template. Therefore, the textural properties were improved toward enhancing the pore size and pore volume. The drug LC was doubled in comparison to the bare MIL-100(Fe). The release-rate profile of ACF was promising as a sustained release of the drug. These MOFs have a typical nanoparticle size and high stability with high loading and very good release rate so that they are promising materials for drug delivery systems. We acknowledge the School of Pharmacy and Faculty of Science and Engineering, Curtin University for providing access to their laboratories and employing different instruments and materials. The authors acknowledge the use of Curtin University’s microscopy and microanalysis facilities, whose instrumentation has been partially funded by University, State, and Commonwealth Government. Valizadeh B, Nguyen TN, Stylianou KC. Shape engineering of metal–organic frameworks. Polyhedron. 2018;145:1–15. Furukawa H, Cordova KE, O’Keeffe M, Yaghi OM. The chemistry and applications of metal-organic frameworks. Science. 2013;341(6149):1230444. Pettinari C, Marchetti F, Mosca N, Tosi G, Drozdov A. Application of metal - organic frameworks. Polym Int. 2017;66(6):731–744. Sun CY, Qin C, Wang XL, Su ZM. Metal-organic frameworks as potential drug delivery systems. Expert Opin Drug Deliv. 2013;10(1):89–101. Horcajada P, Serre C, Vallet-Regí M, Sebban M, Taulelle F, Férey G. Metal-organic frameworks as efficient materials for drug delivery. Angew Chem Int Ed Engl. 2006;45(36):5974–5978. Dhakshinamoorthy A, Asiri AM, Garcia H. Mixed-metal or mixed-linker metal organic frameworks as heterogeneous catalysts. Catal Sci Technol. 2016;6(14):5238–5261. Li SY, Liu ZH. Co5In(BTC)4[B2O4(OH)]2: the first MOF material constructed by borate polyanions and carboxylate mixed ligands. Dalton Trans. 2016;45(1):66–69. Fang Z, Bueken B, De Vos DE, Fischer RA. Defect-engineered metal–organic frameworks. Angew Chem Int Ed Engl. 2015;54(25):7234–7254. Song X, Kim TK, Kim H, et al. Post-synthetic modifications of framework metal ions in isostructural metal–organic frameworks: core–shell heterostructures via selective transmetalations. Chem Mater. 2012;24(15):3065–3073. Ahmad N, Younus HA, Chughtai AH, et al. Development of mixed metal metal-organic polyhedra networks, colloids, and MOFs and their pharmacokinetic applications. Sci Rep. 2017;7(1):832. Wu MX, Yang YW. Metal–organic framework (MOF)-based drug/cargo delivery and cancer therapy. Adv Mater. 2017;29(23):1606134. Wang L, Zheng M, Xie Z. Nanoscale metal–organic frameworks for drug delivery: a conventional platform with new promise. J Mater Chem B. 2018;6(5):707–717. Shakeel F, Ramadan W, Shafiq S. Solubility and dissolution improvement of aceclofenac using different nanocarriers. J Bioequiv Availab. 2009;01(02):39–43. Narayan R, Pednekar A, Bhuyan D, Gowda C, Koteshwara KB, Nayak UY. A top-down technique to improve the solubility and bioavailability of aceclofenac: in vitro and in vivo studies. Int J Nanomedicine. 2017;12:4921–4935. Lee B, Jung H. Enhanced bioavailability of poorly water-soluble aceclofenac using PEG-based solid dispersion in rats, beagle dogs and human subjects. AAPS Annual Meeting, New Orleans, LA, USA. Pharm Sci Supplement. 1999:S614–614. 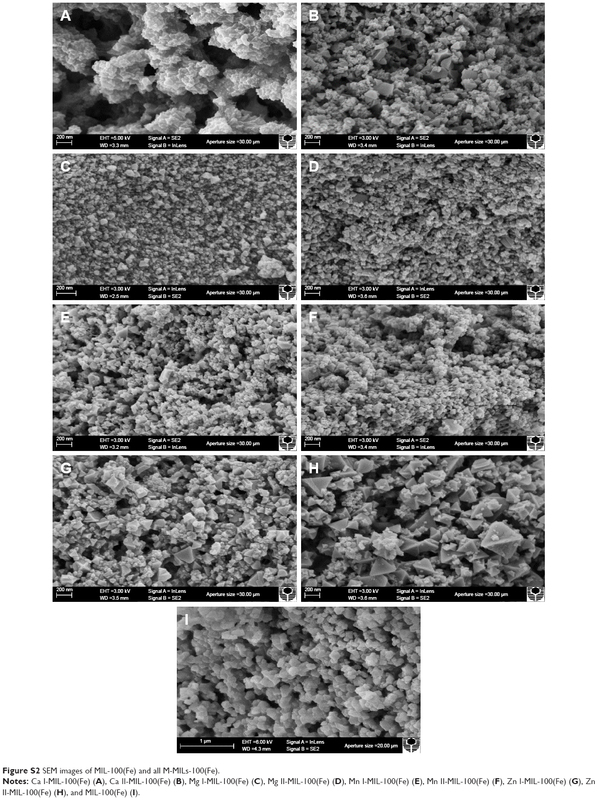 Nagda C, Chotai N, Patel S, Nagda D, Patel U, Soni T. Chitosan microspheres of aceclofenac: in vitro and in vivo evaluation. Pharm Dev Technol. 2010;15(5):442–451. Khandai M, Chakraborty S, Nayak P, et al. 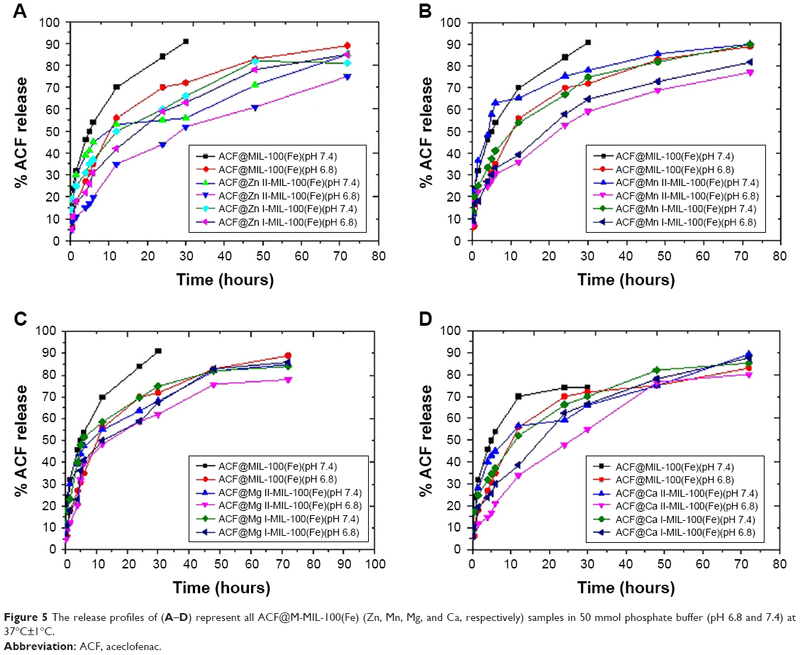 Preparation and in vitro in vivo evaluation of aceclofenac loaded alginate microspheres: an investigation of effects of polymer using multiple comparison analysis. Curr Drug Deliv. 2012;9(5):495–505. Mutalik S, Anju P, Manoj K, Usha AN. Enhancement of dissolution rate and bioavailability of aceclofenac: a chitosan-based solvent change approach. Int J Pharm. 2008;350(1–2):279–290. Ganesh M, Jeon UJ, Ubaidulla U, et al. Chitosan cocrystals embedded alginate beads for enhancing the solubility and bioavailability of aceclofenac. Int J Biol Macromol. 2015;74:310–317. Rojas S, Colinet I, Cunha D, et al. Toward understanding drug incorporation and delivery from biocompatible metal-organic frameworks in view of cutaneous administration. ACS Omega. 2018;3(3):2994–3003. Sostres C, Gargallo CJ, Arroyo MT, Lanas A. Adverse effects of non-steroidal anti-inflammatory drugs (NSAIDs, aspirin and coxibs) on upper gastrointestinal tract. Best Pract Res Clin Gastroenterol. 2010;24(2):121–132. Al Haydar M, Abid HR, Sunderland B, Wang S. Metal organic frameworks as a drug delivery system for flurbiprofen. Drug Des Devel Ther. 2017;11:2685–2695. Zaręba JK, Nyk M, Samoć M. Co/ZIF-8 heterometallic nanoparticles: control of nanocrystal size and properties by a mixed-metal approach. Cryst Growth Des. 2016;16(11):6419–6425. Saliba D, Ammar M, Rammal M, Al-Ghoul M, Hmadeh M. Crystal growth of ZIF-8, ZIF-67, and their mixed-metal derivatives. J Am Chem Soc. 2018;140(5):1812–1823. Orellana-Tavra C, Mercado SA, Fairen-Jimenez D. Endocytosis mechanism of nano metal-organic frameworks for drug delivery. Adv Healthc Mater. 2016;5(17):2261–2270. Abid HR, Rada ZH, Duan X, Sun H, Wang S. Enhanced CO2 adsorption and selectivity of CO2/N2 on Amino-MIL-53(Al) synthesized by polar co-solvents. Energy Fuels. 2018;32(4):4502–4510. Botas JA, Calleja G, Sánchez-Sánchez M, Orcajo MG. Effect of Zn/Co ratio in MOF-74 type materials containing exposed metal sites on their hydrogen adsorption behaviour and on their band gap energy. Int J Hydrogen Energy. 2011;36(17):10834–10844. Jiao Y, Morelock CR, Burtch NC, Mounfield WP, Hungerford JT, Walton KS. Tuning the kinetic water stability and adsorption interactions of Mg-MOF-74 by partial substitution with Co or Ni. Ind Eng Chem Res. 2015;54(49):12408–12414. Gotthardt MA, Schoch R, Wolf S, Bauer M, Kleist W. Synthesis and characterization of bimetallic metal-organic framework Cu-Ru-BTC with HKUST-1 structure. Dalton Trans. 2015;44(5):2052–2056. Yang X, Xu Q. Bimetallic metal–organic frameworks for gas storage and separation. Cryst Growth Des. 2017;17(4):1450–1455. Yuan S, Qin JS, Lollar CT, Zhou HC. Stable metal–organic frameworks with group 4 metals: current status and trends. ACS Cent Sci. 2018;4(4):440–450. Yuan L, Tian M, Lan J, et al. Defect engineering in metal-organic frameworks: a new strategy to develop applicable actinide sorbents. Chem Commun (Camb). 2018;54(4):370–373. Yuan S, Qin JS, Li J, et al. Retrosynthesis of multi-component metal-organic frameworks. Nat Commun. 2018;9(1):808. Vuong GT, Pham MH, Do TO. Synthesis and engineering porosity of a mixed metal Fe2Ni MIL-88B metal-organic framework. Dalton Trans. 2013;42(2):550–557. Vallet-Regí M, Balas F, Arcos D. Mesoporous materials for drug delivery. Angew Chem Int Ed Engl. 2007;46(40):7548–7558. Li W, Zhang Y, Zhang C, et al. Transformation of metal-organic frameworks for molecular sieving membranes. Nat Commun. 2016;7:11315. Hussain MA, Zarish A, Abbas K, et al. Hydroxypropylcellulose-aceclofenac conjugates: high covalent loading design, structure characterization, nano-assemblies and thermal kinetics. Cellulose. 2013;20(2):717–725. Krajnc A, Kos T, Zabukovec Logar N, Mali G. A simple NMR-based method for studying the spatial distribution of linkers within mixed-linker metal-organic frameworks. Angew Chem Int Ed Engl. 2015;54(36):10535–10538. Honary S, Zahir F. Effect of zeta potential on the properties of nano-drug delivery systems-a review (Part 1). Tropical J Pharmaceut Res. 2013;12(2):255–264. Honary S, Zahir F. Effect of zeta potential on the properties of nano-drug delivery systems-a review (Part 2). Tropical J Pharmaceut Res. 2013;12(2):265–273. Manaia EB, Abuçafy MP, Chiari-Andréo BG, Silva BL, Oshiro Junior JA, Chiavacci LA. Physicochemical characterization of drug nanocarriers. Int J Nanomed. 2017;12:4991–5011. Deshmukh RK, Naik JB. 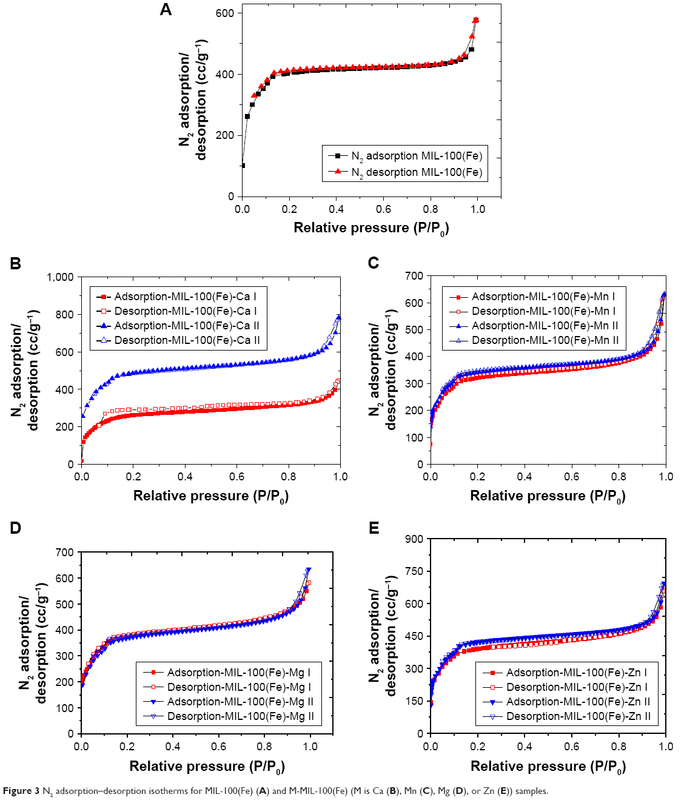 The impact of preparation parameters on sustained release aceclofenac microspheres: a design of experiments. Adv Powder Technol. 2015;26(1):244–252. Aerts CA, Verraedt E, Mellaerts R, et al. Tunability of pore diameter and particle size of amorphous microporous silica for diffusive controlled release of drug compounds. J Phys Chem C. 2007;111(36):13404–13409. Xu W, Riikonen J, Lehto VP. Mesoporous systems for poorly soluble drugs. Int J Pharm. 2013;453(1):181–197. Li X, Lachmanski L, Safi S, et al. New insights into the degradation mechanism of metal-organic frameworks drug carriers. Sci Rep. 2017;7(1):13142. Sun K, Li L, Yu X, et al. Functionalization of mixed ligand metal-organic frameworks as transport vehicles for drugs. J Colloid Interface Sci. 2017;486:128–135. 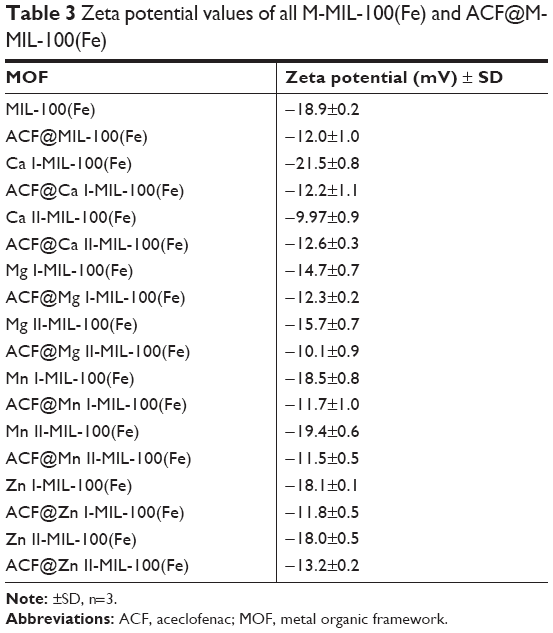 Figure S1 TGA profiles of M-MIL-100(Fe) (where M is either Ca, Mg, Mn, or Zn). Figure S2 SEM images of MIL-100(Fe) and all M-MILs-100(Fe). Notes: Ca I-MIL-100(Fe) (A), Ca II-MIL-100(Fe) (B), Mg I-MIL-100(Fe) (C), Mg II-MIL-100(Fe) (D), Mn I-MIL-100(Fe) (E), Mn II-MIL-100(Fe) (F), Zn I-MIL-100(Fe) (G), Zn II-MIL-100(Fe) (H), and MIL-100(Fe) (I). 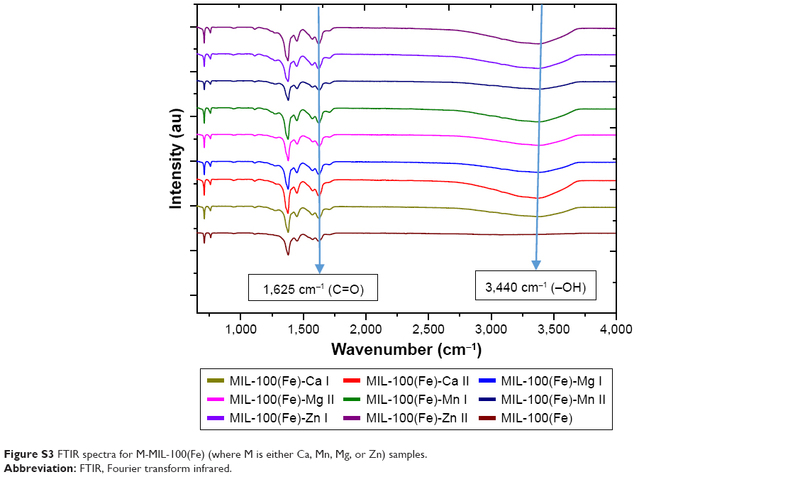 Figure S3 FTIR spectra for M-MIL-100(Fe) (where M is either Ca, Mn, Mg, or Zn) samples. Abbreviation: FTIR, Fourier transform infrared.